Everyone needs a good granola recipe. I spent years making fancy granolas with every embellishment conceivable. They were pretty and healthy, but expensive to make and appealed to a very small sampling of people who happened to like that particular blend of seeds, coconut, and dried fruit (i.e., not my kids). I was introduced to this granola a year ago, and have made nothing else since. It is easy, light, and crisp, and its simplicity allows you to customize your bowlful with any add-ins you like. The nuts add protein, but if you want an even simpler granola, just replace the nuts with additional oats. Try this sprinkled over yogurt or ice cream. Do not be tempted to substitute honey for the maple syrup. 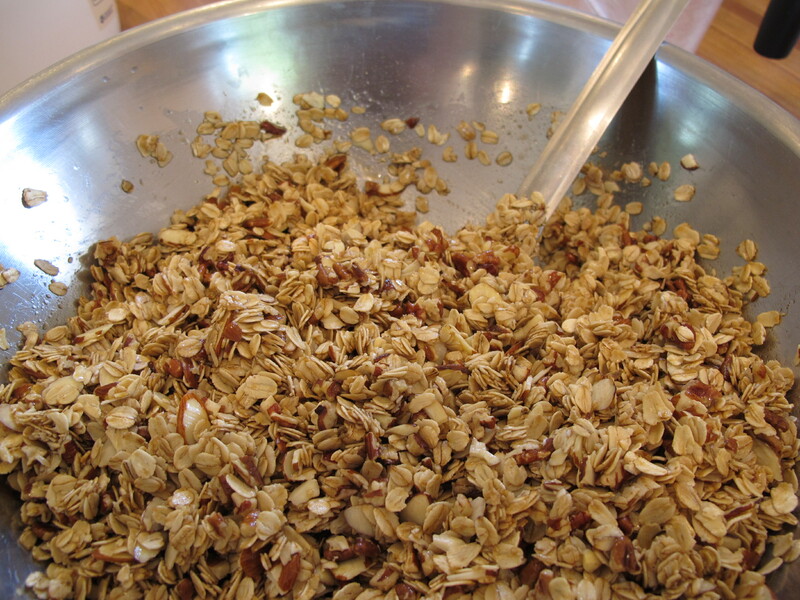 The granola will cement into the pan and lose its light crispness. (Ask me how I know.) I almost never bake with maple syrup due to the expense, but this recipe is a worthwhile exception. Preheat oven to 325 and oil two rimmed baking sheets. Melt oil gently with maple syrup and vanilla. Mix dry ingredients and blend with oil mixture. Divide granola between baking sheets. Bake for 15-20 min. Crumble and store when cool.